The Formax FD 6606 Series of inserters are versatile and can adapt to most any folding and inserting jobs you throw at it! 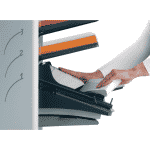 The Formax 6606 Series inserters is capable of folding and inserting sheets that have the address in the middle, bottom or top into top-flap envelopes. 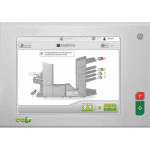 ** With it’s large reversible full-color touchscreen control panel beautiful easy to use graphical interface, setup is a breeze. This series can be configured with 2 to 7 stations, offering total flexibility. You can even select from a variety of feeders, including a high-capacity document feeder that holds up to 725 sheets, choice of 1 or 2 high-capacity production feeders, standard and special feeders to accommodate special inserts, and short feed trays for small inserts. It has automatic envelope presence and paper sensors with indicators on the control panel for easy of operation and setup. A vertical output stacker that can hold up to 500 filled envelopes. A large top-loading envelope feeding bin with a capacity of up to 500 envelopes are all standard features of the Formax FD 6606 Series of inserters. The 6606 Series also includes an energy-saving feature which automatically puts the inserter into standby mode after 1 hour of being idle to save on electricity. Do you have a job were some people will get 2 sheets and others will get 3 or more!? BCR (Optional Barcode Recognition) and OMR (Optical Mark Recognition) feature CIS scanning technology which scans the entire width of the document, for greater flexibility in document design and reduced setup time between jobs including the ability to read codes in different positions. OMR and BCR allow for the automatic insertion of multiple-page documents, eliminating the tedious task of manually collating and inserting. 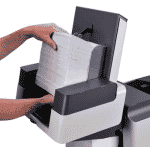 Optical Character Recognition (OCR) is also available, for page numbering in 1/1 or N-of-M formats which helps to ensure each set is complete before being inserted into an envelope and sealed.With the Formax FD 6606, double document detectors ensure that no double documents are fed into the system. Documents requiring inspection or special handling can be diverted automatically into the divert station, without interrupting productivity. The flexible modular design of the Formax FD 6606 Series is designed to meet your ever changing business needs. It can insert documents up to 14” long, including checks, invoices and reply envelopes, in almost any combination, plus, special feeders are capable of handling glossy or thicker stock. The Formax FD 6606 Series has flexible inserting capabilities with an optional 725 sheet High-Capacity Document Feeder, 1 or 2 optional Production Feeders with a maximum capacity of up to 1,200 sheets or 325 business rely envelopes, each, an optional Thin Booklet Feeder for up to 325 inserts, and High-Capacity Envelope Hopper for up to 1,000 envelopes. The standard vertical output stacker holds up to 500 filled envelopes. Additional output configurations include a side exit tray for up to 500 envelopes or an output conveyor which holds up to 1,000 filled envelopes to help increase productivity. The Formax FD 6606 Series of inserters can processes up to 4,300 envelopes per hour and producing up to 80,000 per month. 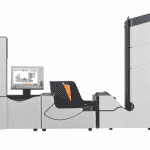 The 6606 series is powerful enough to fold up to 10 sheets in half-fold and up to 8 sheets in tri-fold mode. 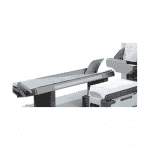 Each standard feeder holds up to 325 sheets, while the available High-Capacity Document Feeder holds up to 725 sheets. * Paper & envelope specifications may vary. All media must be tested.